A couple of years ago, I remember talking to a stylist at a photo shoot about an event she had been to. She was telling me all about these incredible knitted animal heads that hung on the wall like taxidermy. 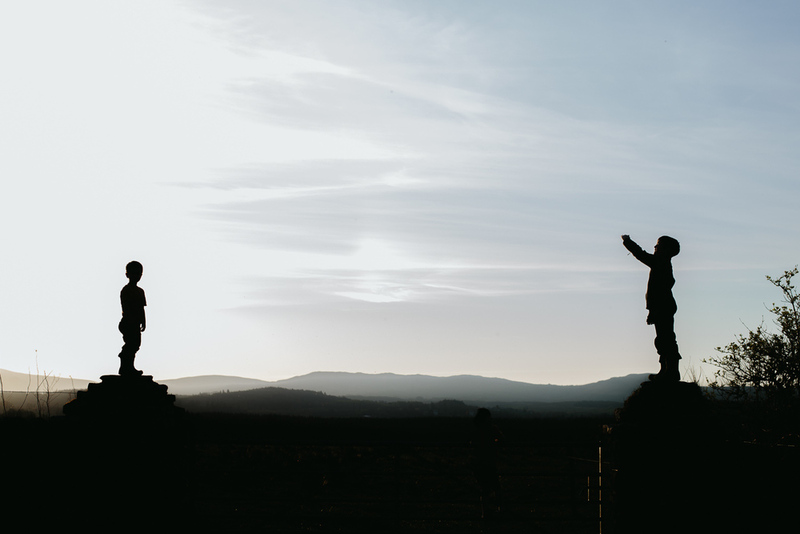 My curiosity piqued, I began an internet hunt for their creator and stumbled across the delightful work of Louise Walker and her blog, Sincerely Louise. If you don't already have Sincerely Louise in your blog reader, go right now and do it! 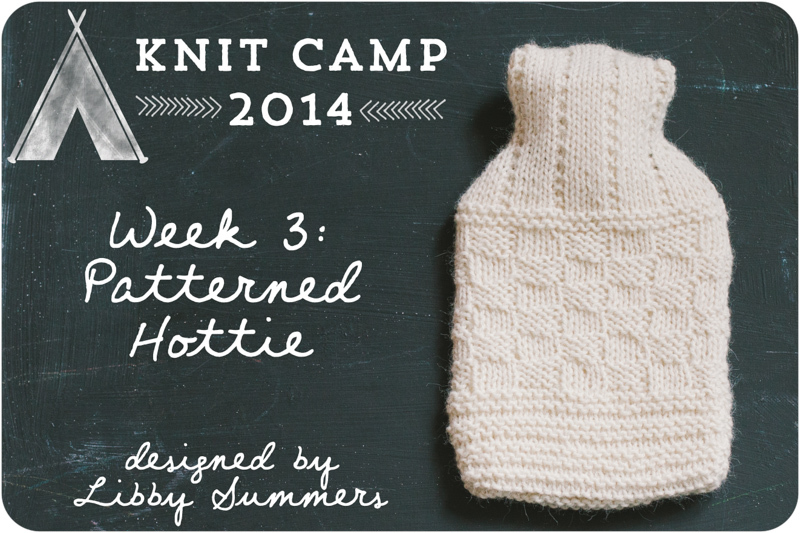 Its full of fun and quirky knitting patterns for the most adorable toys and accessories. Don't worry, I'll wait. 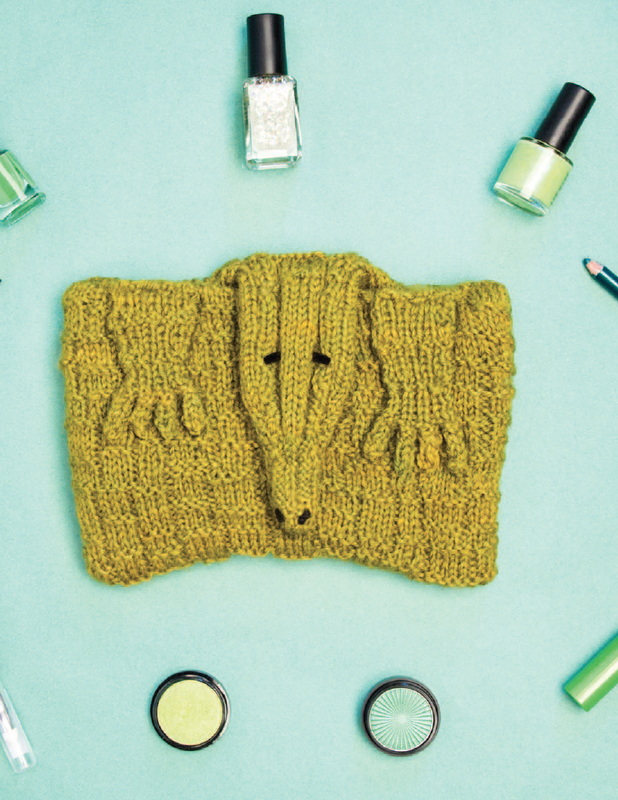 Later this week, Louise's first book, Faux Taxidermy Knits, is out. Its full of the same kind of delightful creations as have been on her blog. My favourite is probably the hedgehog slippers or the Croc makeup bag. Lots of fun, sweet and very quirky makes. You can buy the book from here. Follow the rest of the blog book tour here. It used to be there was a strong US/UK divide when it came to yarn. 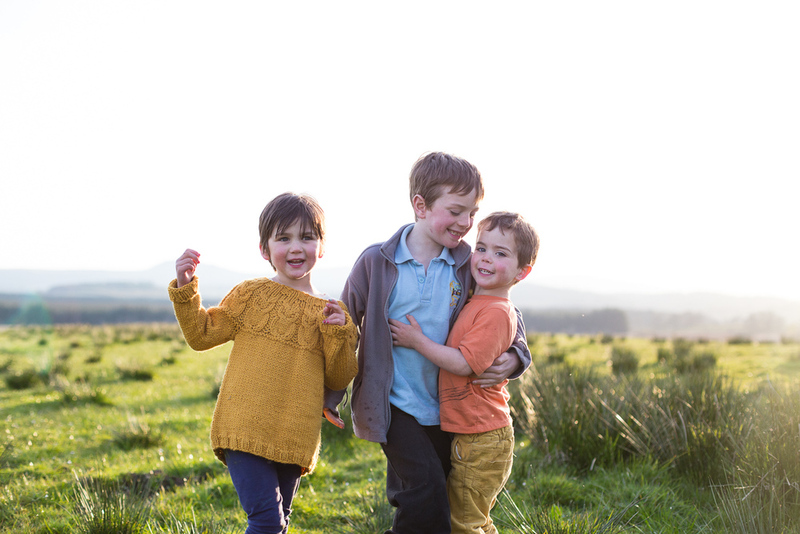 Yes, there was some cross over with Noro, Rowan and a few others, but on the whole, yarn brands were very different on either side of the pond. It amazes me as an American in the UK to see more and more of the US brands I am familiar with to be increasingly available here. One of the most notable cross overs has to be the arrival of Lion Brand Yarn to Deramores. I have to admit to having a special place in my heart for Lion Bran and, specifically, Vanna's Choice. I am not normally a huge fan of acrylic, but the woman who taught me to crochet, my Grandma Ethel, was obsessed with Vanna White. Vanna was more than just a game show host, Grandma talked about her like a friend---the details of whose life she learned from the selection of tabloid newspapers at the grocery store check out. Every night we would watch Wheel of Fortune, with Grandma Ethel crocheting away on enormous acrylic ripple blankets in colour combinations only the 1980's could dream up. Grandma would talk loudly over the telly, telling us all about Vanna - her kids, her houses, what she liked to wear and eat. I simply can't see a mention of Vanna's Choice yarn and not be transported back to that livingroom in Bethany, Missouri. Well, Deramores has graciously offered to give away 1 pack of Lion Brand yarn shown above! The competition is open world wide and all you need to do is hop over to the competition page to enter. The give-away is open world wide and closes on the 31st of January. Thanks to Deramores for sponsoring the giveaway! 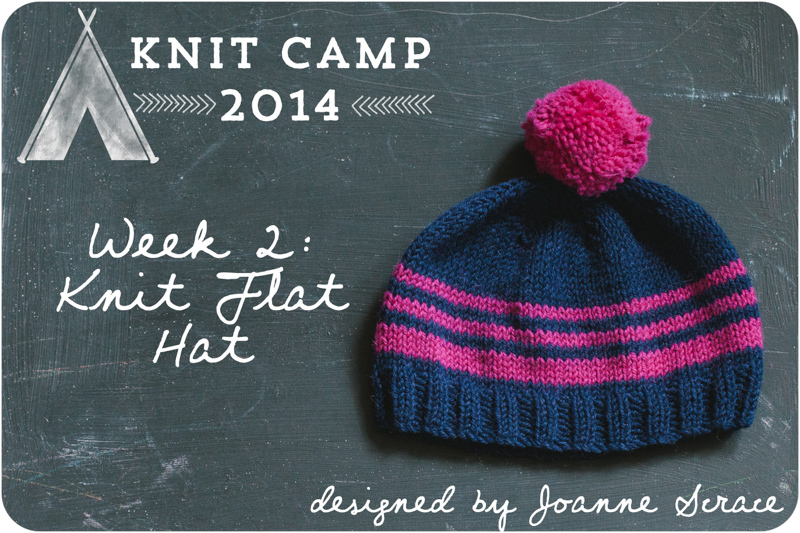 Ok. You've got your needles and yarn. 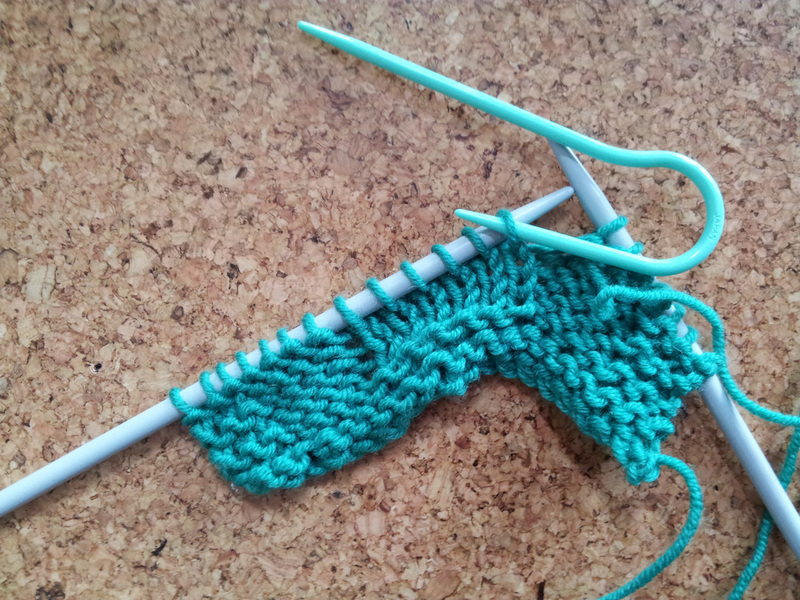 You have cast on and now comes the moment of truth: Knitting. 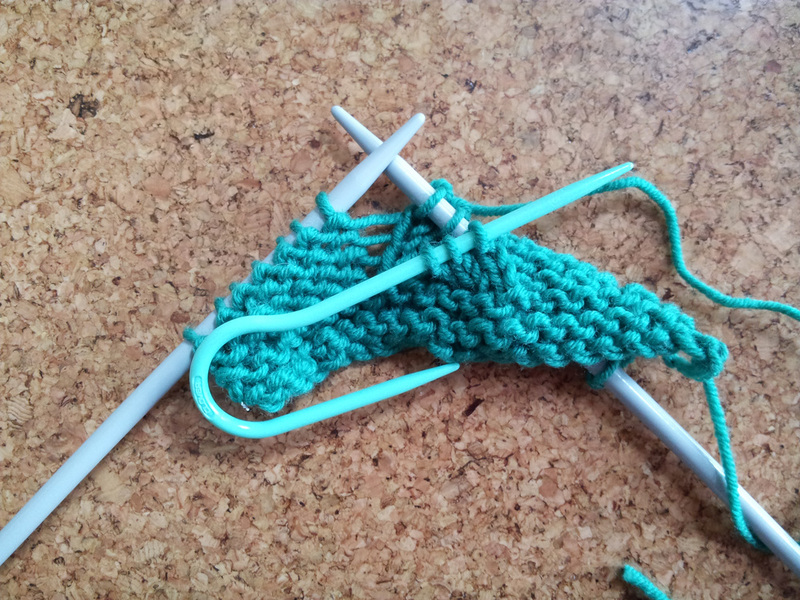 At a most basic level, knitting is only 2 stitches: Knit and Purl. 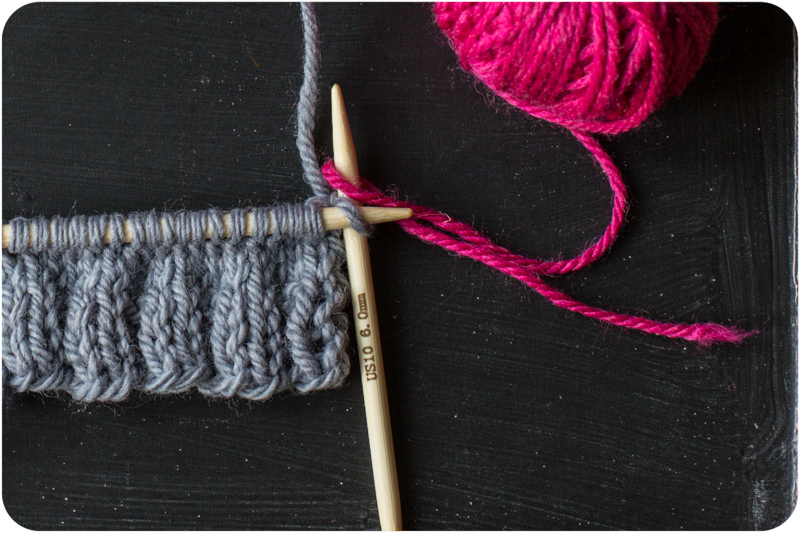 Yes, there are other things you can do, but knit and purl are the building blocks of knitting. 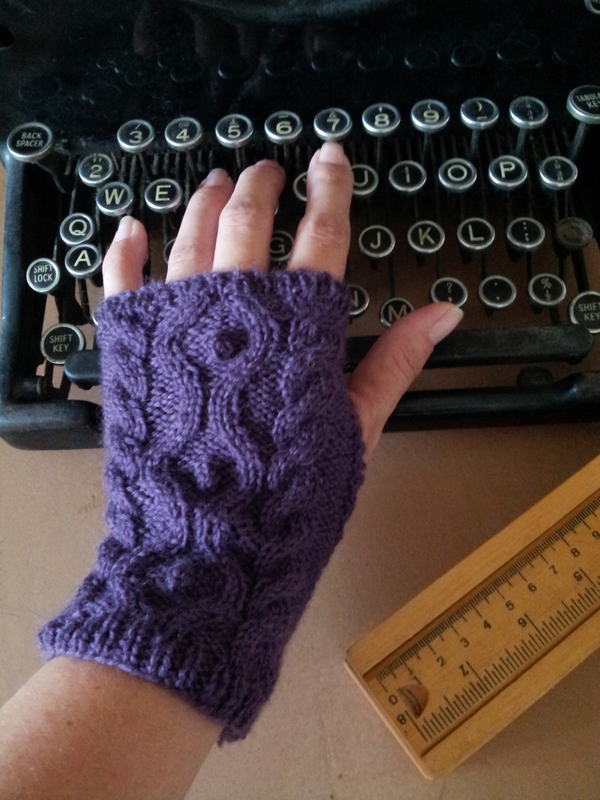 The posts today and tomorrow will show you both English Style (yarn held in the right hand) and Continental Style (yarn held in the left hand). 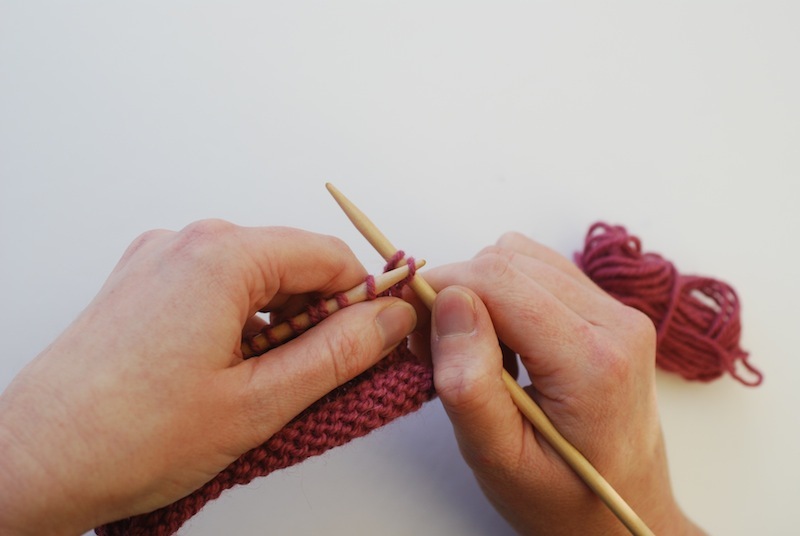 In my experience, crocheters learning to knit will often find that it is easier if they hold the yarn in the same hand for knitting as crochet, so if you are right handed, this means holding the yarn in your left, aka Continental. 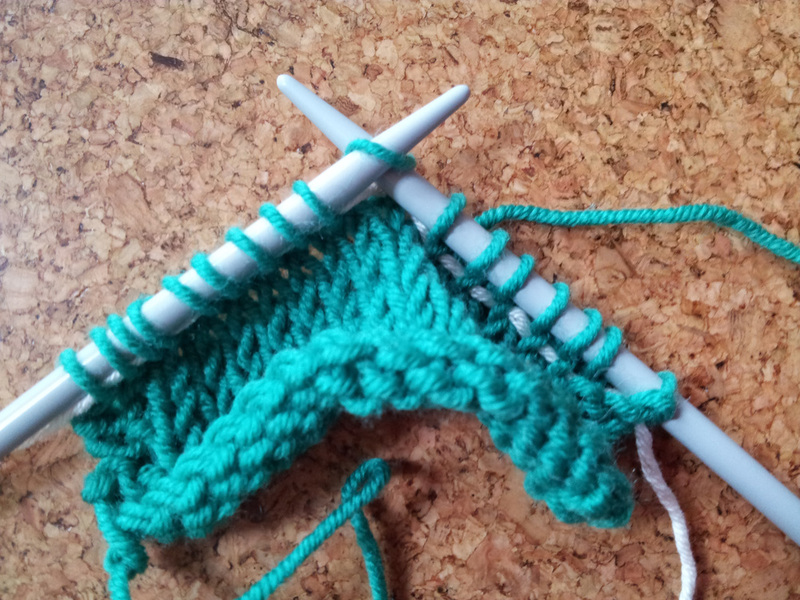 That said, if you have learned to knit before and are in the UK, you probably were taught English Style. Both are absolutely the right way and both have their benefits and drawbacks. Importantly, do what feels comfortable to you. 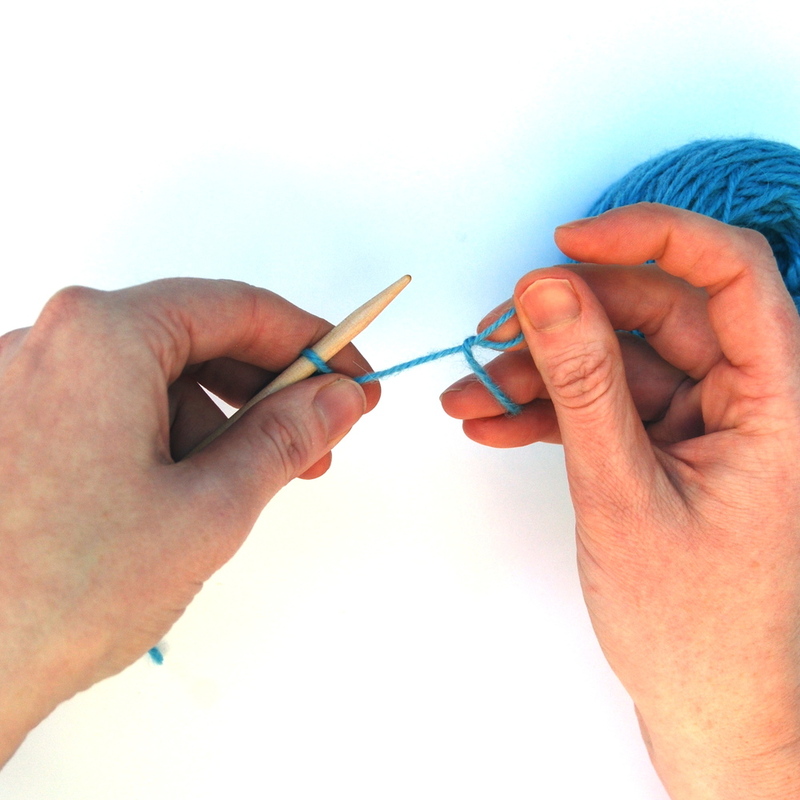 Hold the needle with your cast on stitches in your left hand and your empty needle with your right. 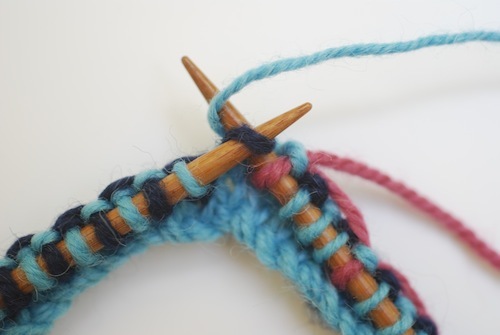 The working yarn should be at the right side of your stitches. 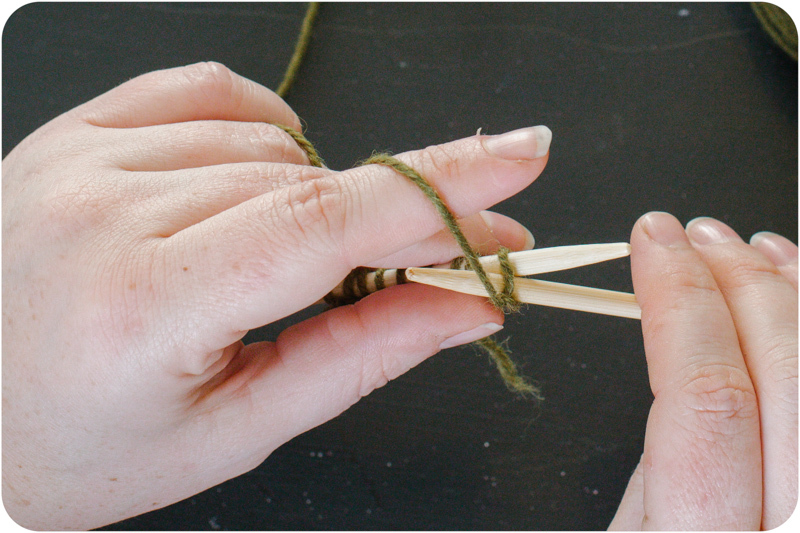 In English Style Knitting, the yarn is held in your right hand. 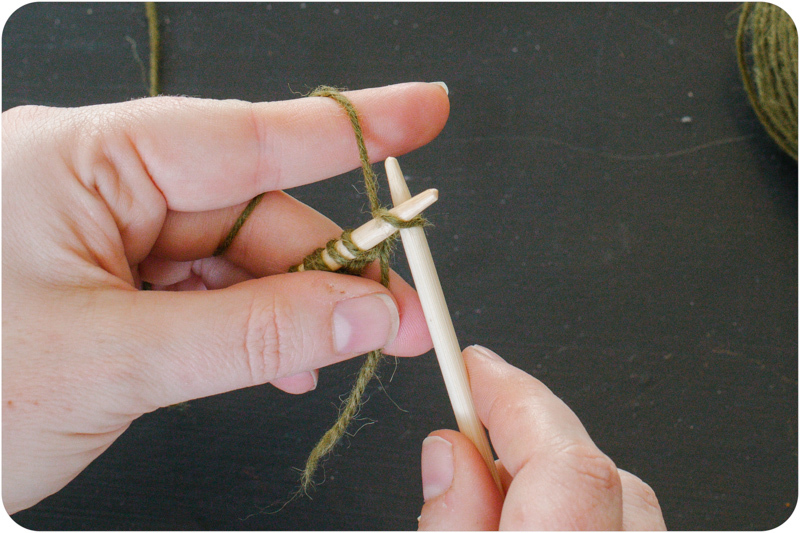 Usually, you will thread the yarn through your fingers to keep tension in the yarn. How you do this is entirely up to you. 1. 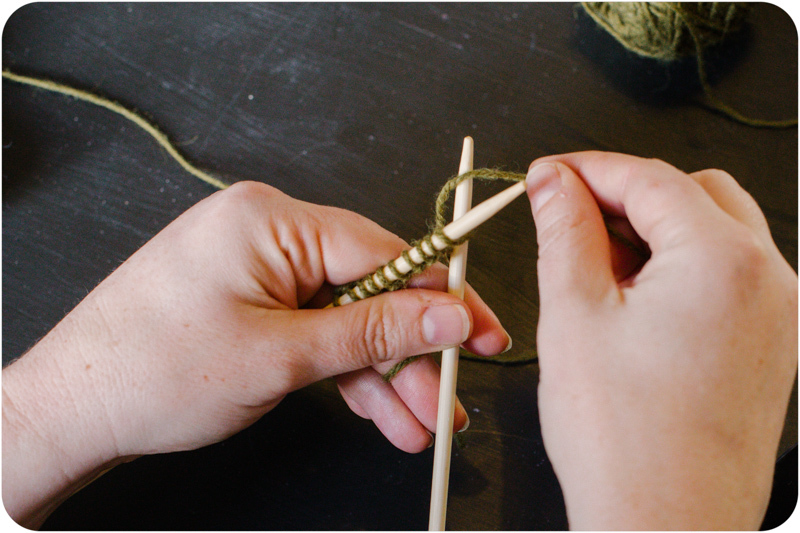 With your working yarn held to the back of your work, insert your right handed needle from front to back through the front leg of the first stitch on your left needle. 2. 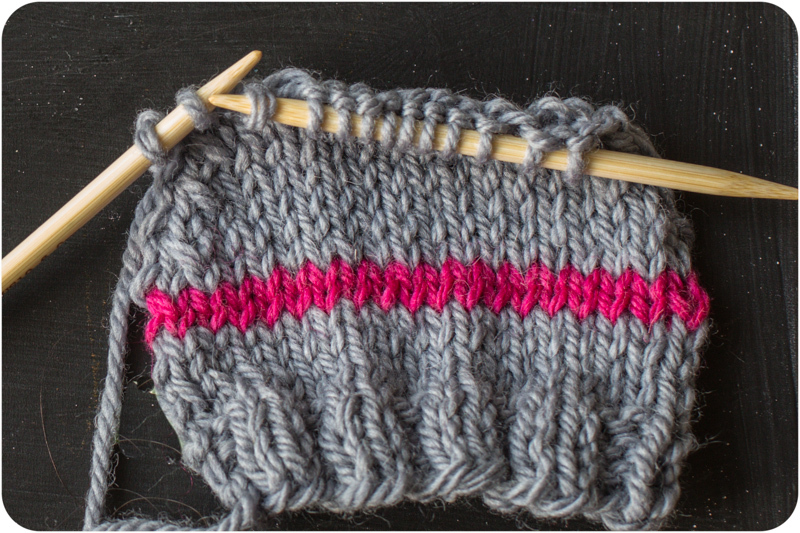 Bring your yarn under, around then over the top of the right hand needle. 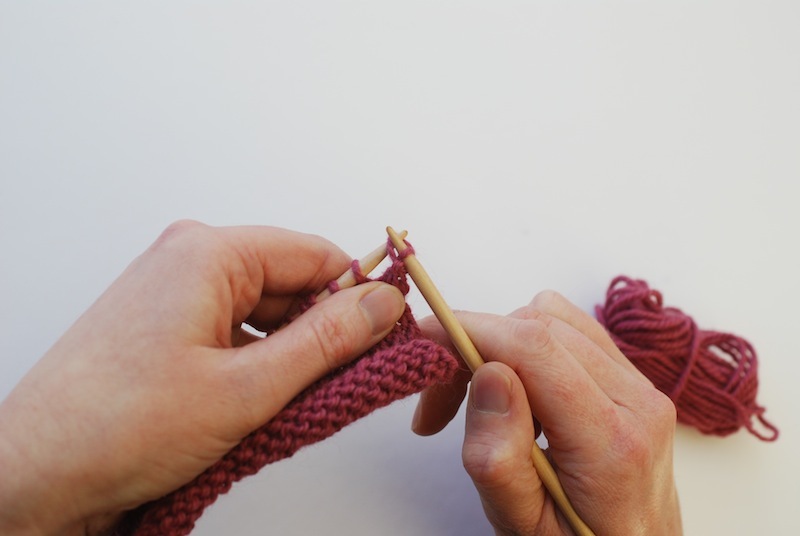 Initially, it may be easiest to hold both of the needles in your left hand and bring the yarn around with your whole hand. 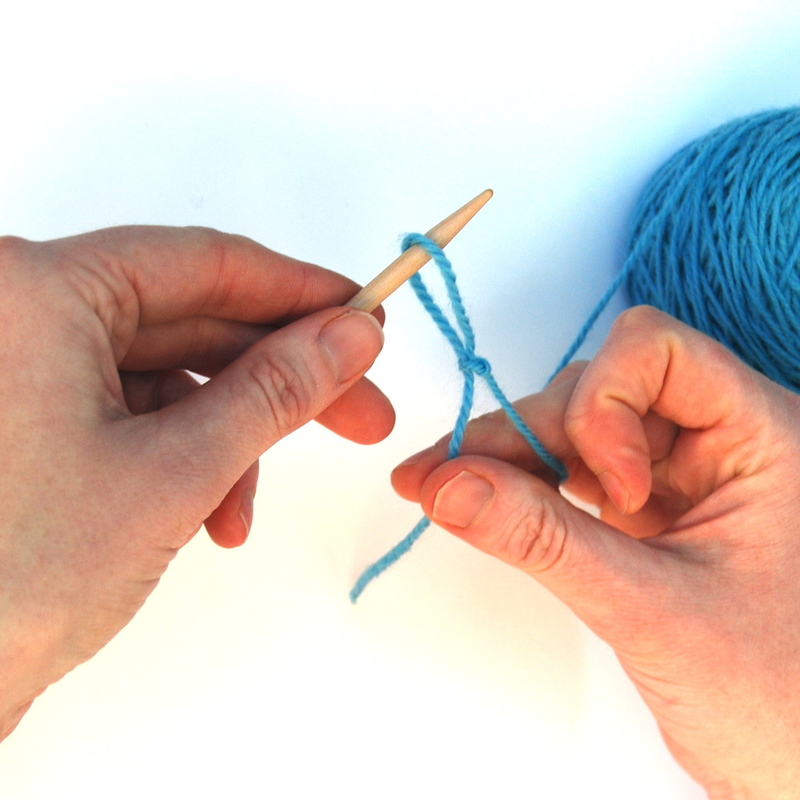 With time, may knitters can use just one finger to bring the yarn around the needle. 3. 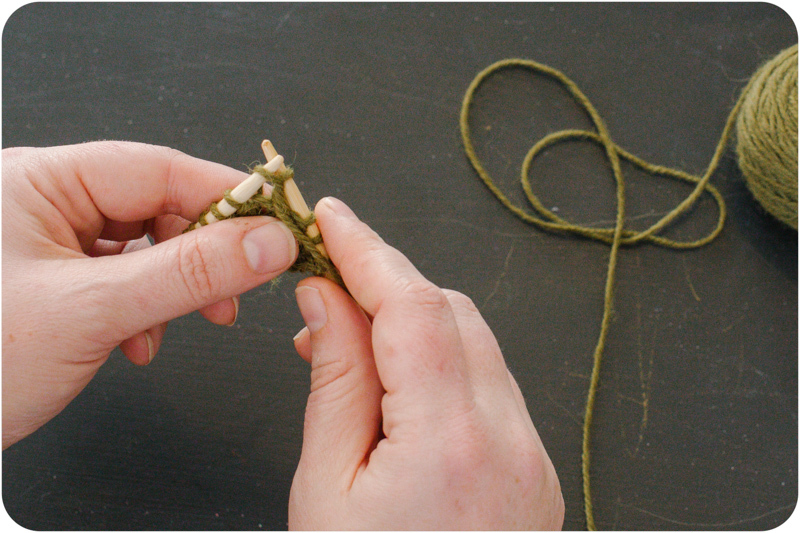 Using your right needle, pull the loop you just made on your right needle through the loop on your left needle. 4. 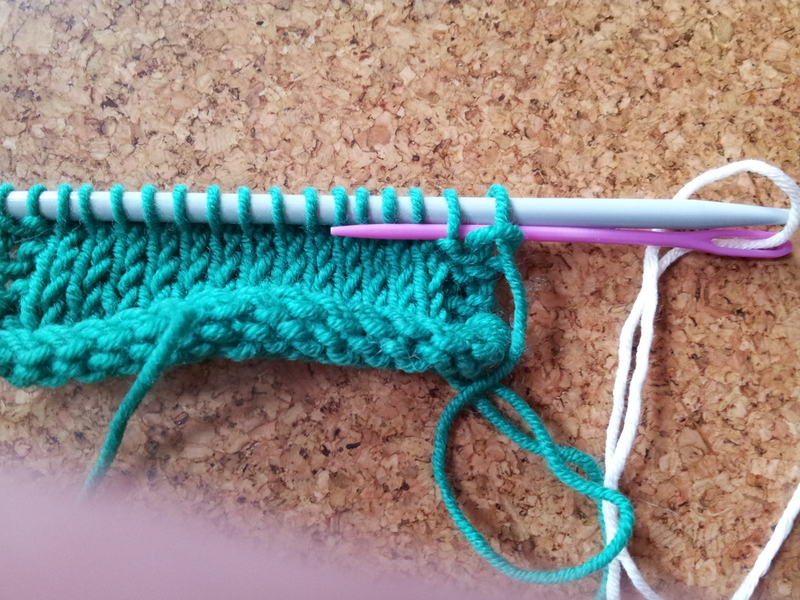 Let the loop from that loop slide off the left needle. 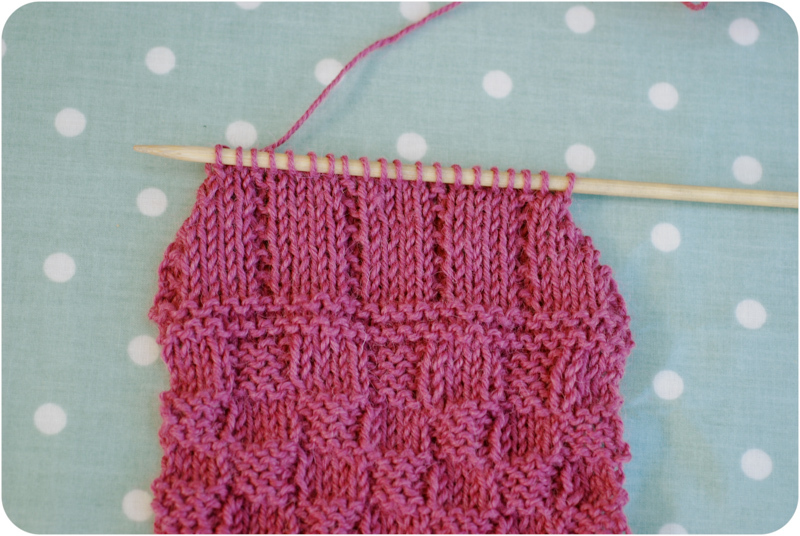 You should have 1 stitch on your right needle and 1 less stitch on your left needle. 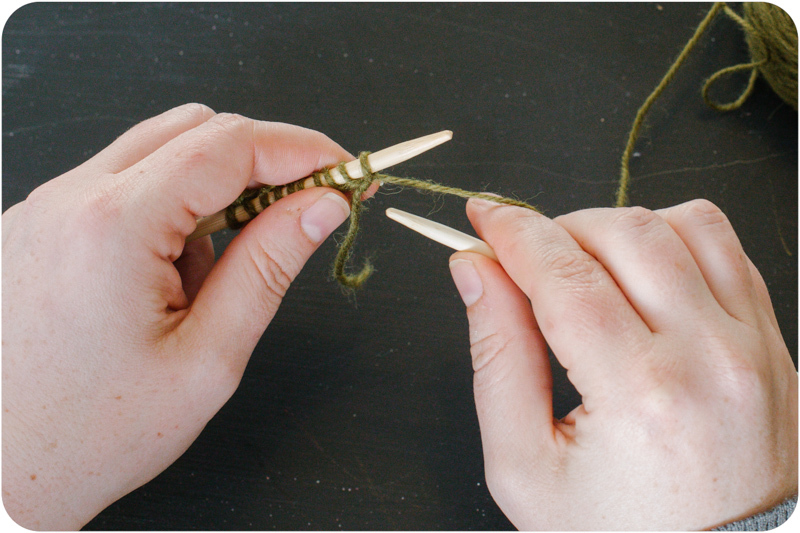 Repeat steps 1-3 for all of the stitches on your right hand needle or as many stitches as required. 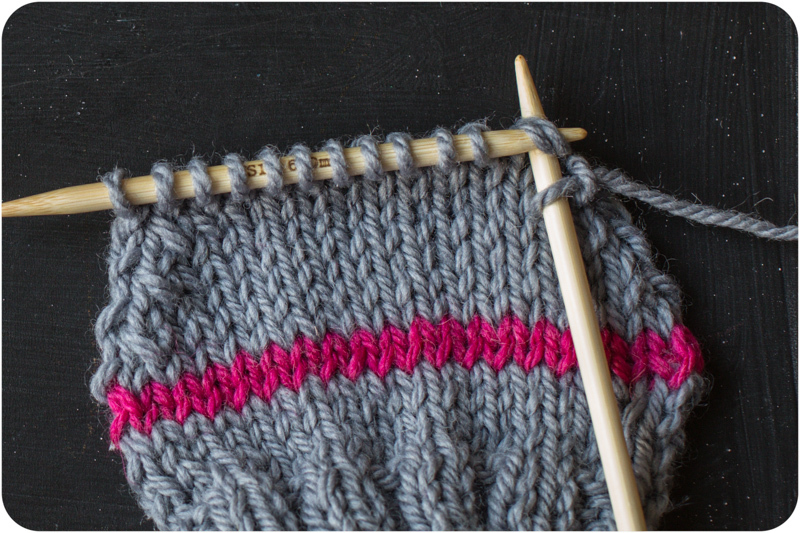 At the end of the row, all of your stitches will have been worked onto your right hand needle. 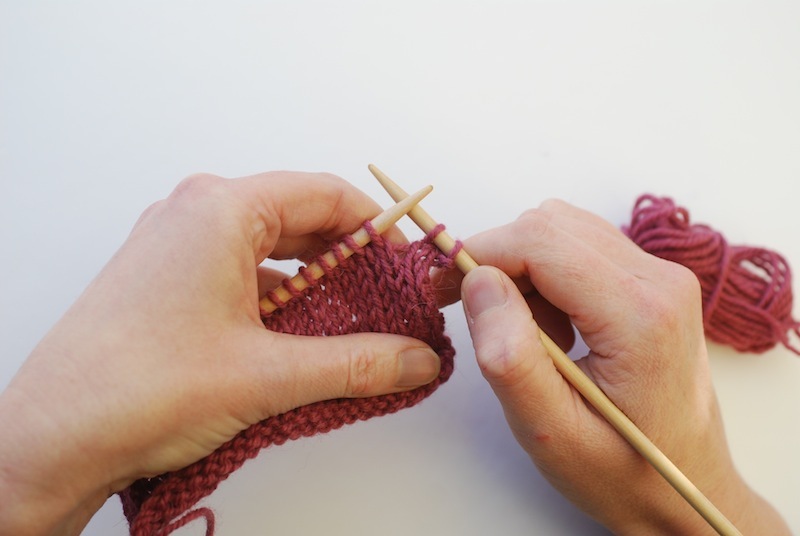 To continue onto the next row, you will turn your work, placing the needle with the stitches on it in your left hand and the working yarn to the right and side of your work. 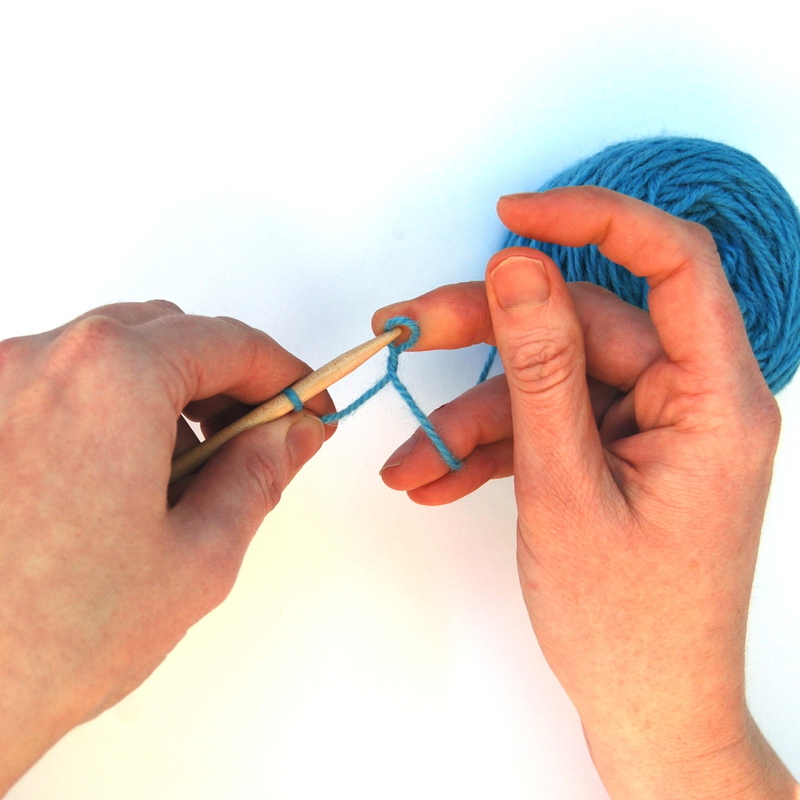 Hold the needle with your cast on stitches in your left hand and your empty needle with your right. 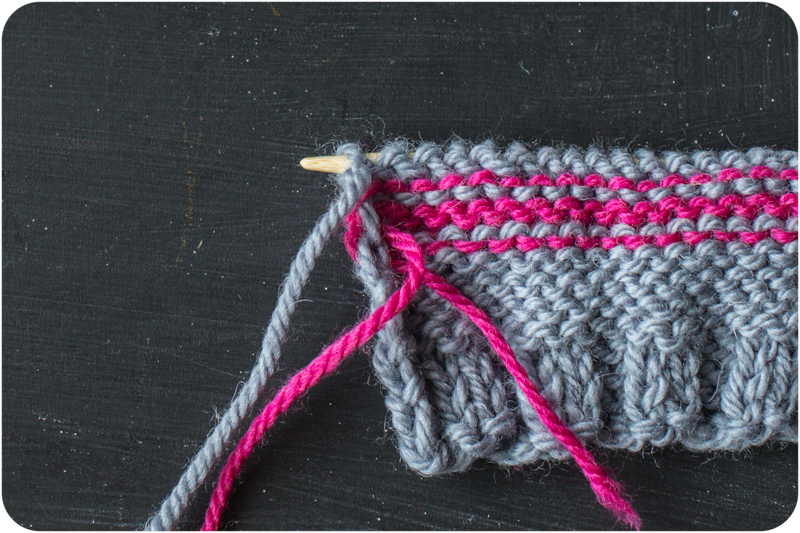 The working yarn should be at the right side of your stitches. 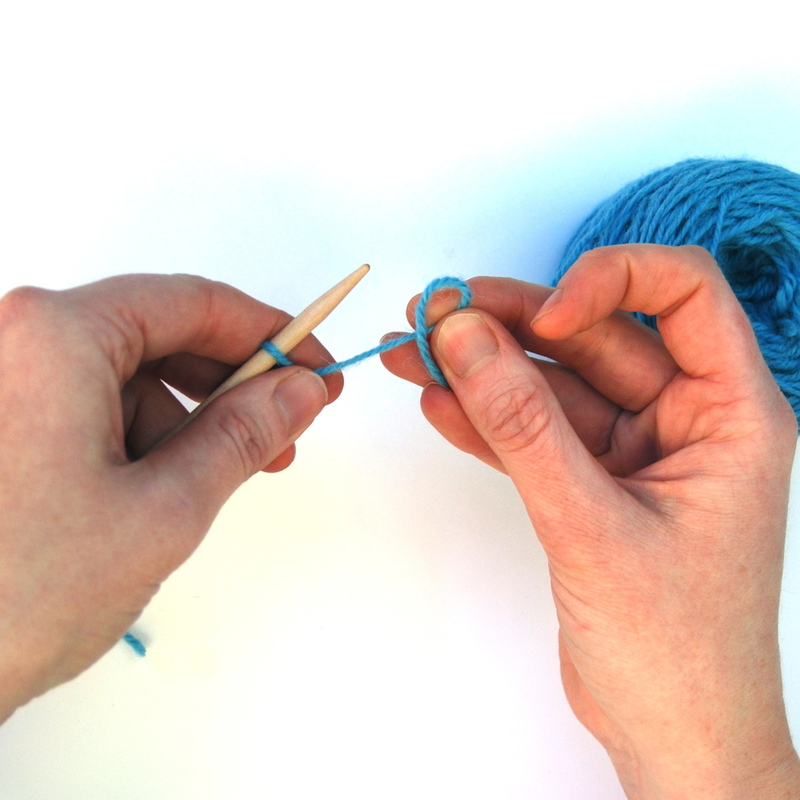 You will hold the working yarn in your left hand. 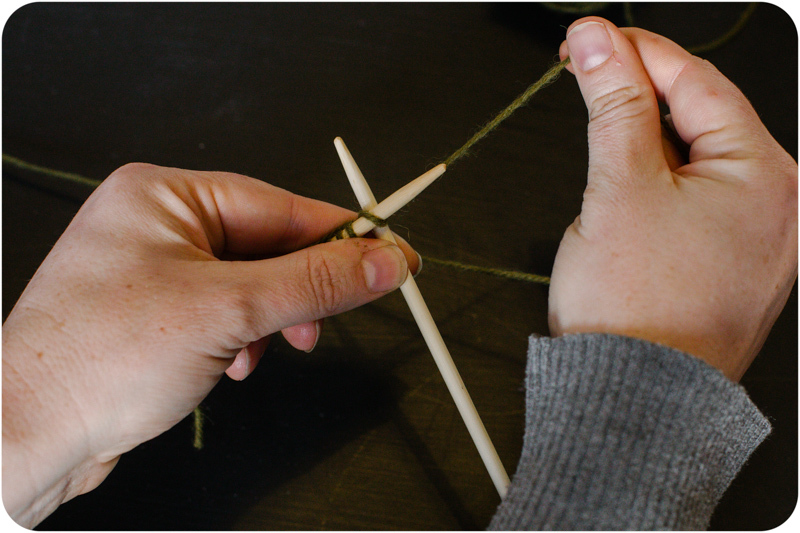 Usually, you will thread the yarn through your fingers to keep tension in the yarn. How you do this is entirely up to you. 1. 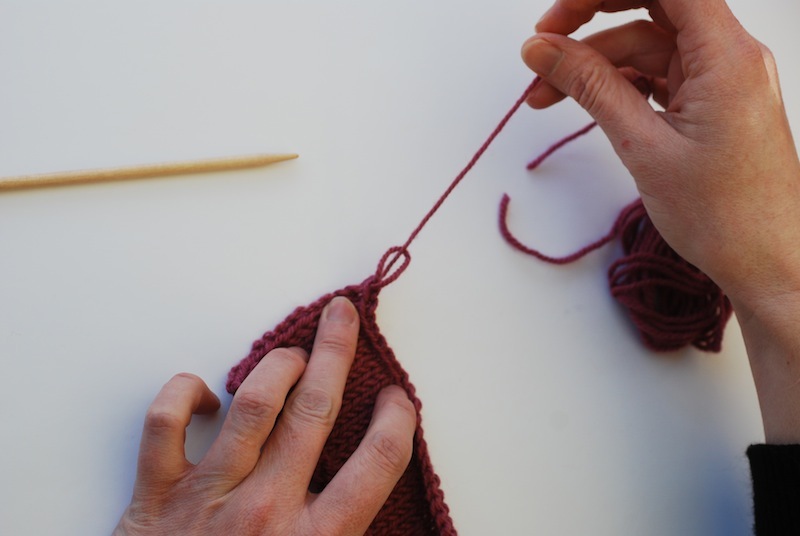 With your working yarn held to the back, insert your right handed needle from front to back through the front leg of the first stitch on your left needle. 2. 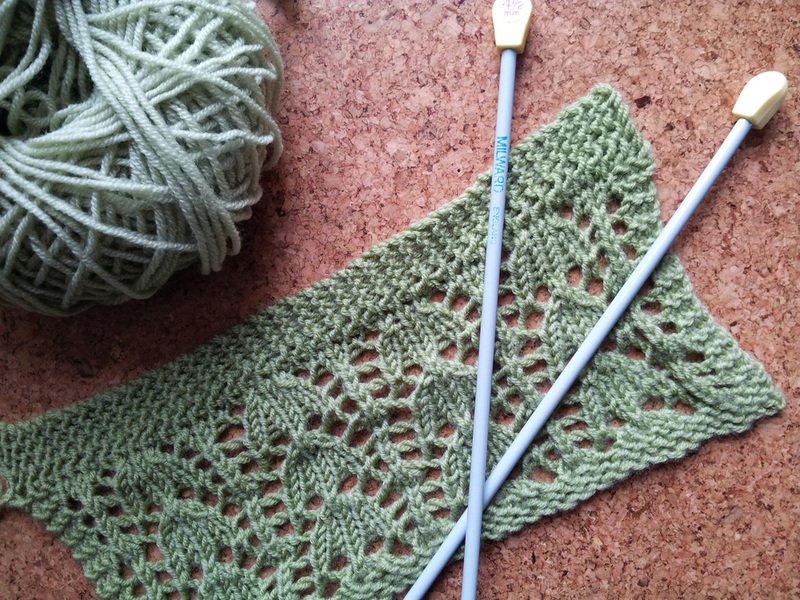 Going over the top of your right needle, bring the yarn over and down. 4. 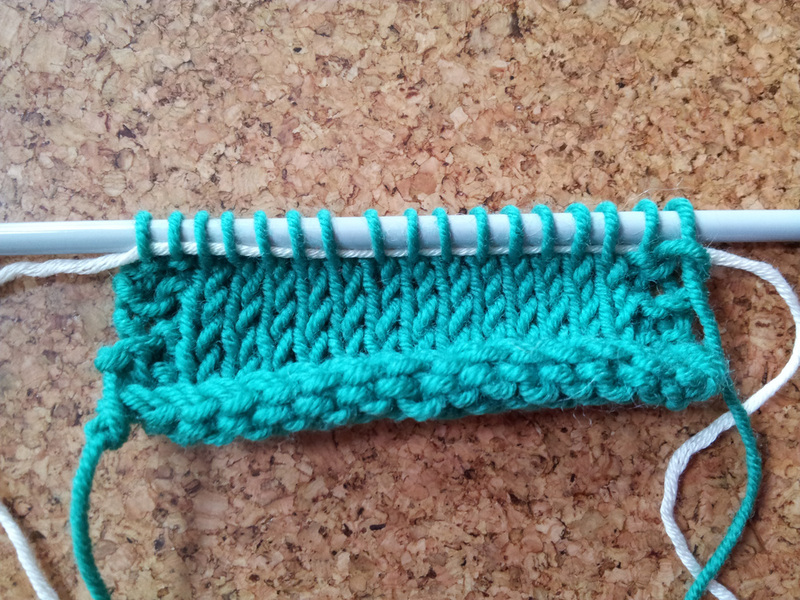 Let the loop from the left needle slip off as you move your new stitch further down the right needle. 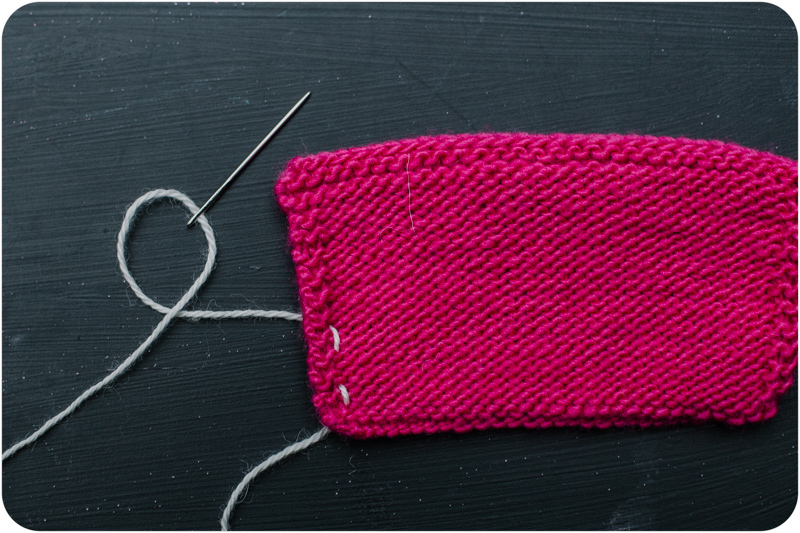 You should have 1 stitch on your right needle and 1 less stitch on your left needle. 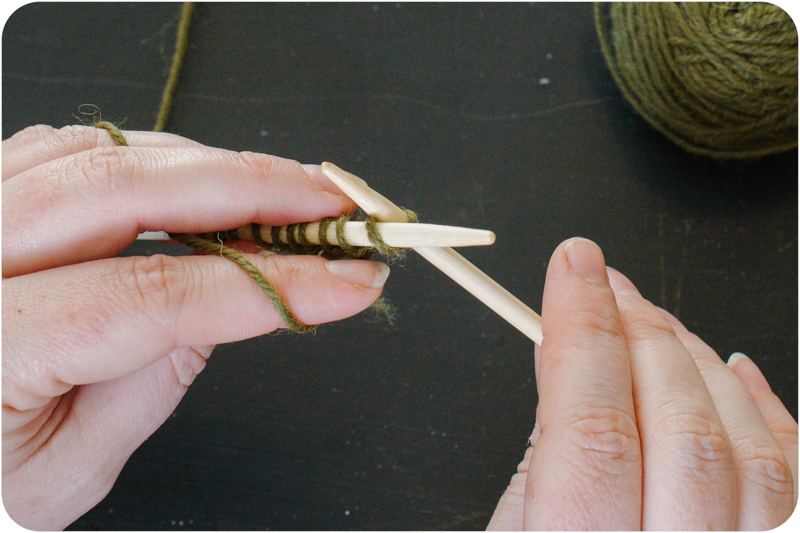 At the end of the row, all of your stitches will have been worked onto your right hand needle.